Extending SAP BW with predictive insights can add tremendous value to your business processes. In this series of blogs I want to shed some light on how an existing SAP BW can be combined with SAP Predictive Analytics to realise these benefits. Even if you are not using predictive models just yet, your SAP BW is probably a very central component for many of your business activities. It turns data into valuable information, which can be leveraged across all business processes. Your end users will probably access and analyze the SAP BW data in their Business Intelligence front-end. SAP BW might also be the backbone of your planning processes. Or predefined rules might be used to automate decisions in your business applications. These are just a few examples, many more use cases are possible of course. The same data that is already being maintained by SAP BW can also be used for predictive purposes, which can give the value of your SAP BW a tremendous boost! What did my customer buy last year? How was the demand for my products? What was my net working capital? What is my best up-selling opportunity for a specific customer? Given demand constraints, how should I optimize my operational capacity? What is my future cash flow likely to be, in order to leverage the financial flexibility or to deal with financial limitations? SAP Predictive Analytics acts as an information generator, which produces predictions that can be written back into SAP BW. The SAP BW data can be prepared for predictive purposes, predictive models can be trained and applied to produce predictions. These forecasts can be written back into SAP BW, thereby any other application with access to SAP BW can benefit from this insight. The predictive models are automatically monitored and retrained if needed to ensure high quality predictions without the need of any manual interventions. Predictions can also be calculated on the fly in real-time. This series of blogs is focusing on producing predictions in a batch mode with persistence though. The high degree of automation that SAP Predictive Analytics provides, allows SAP BW Experts or Data Analysts, who might not have completed a degree in Statistics, to create predictions themselves. If you are a Data Scientist, congratulations! The automation can then take care of the recurring requirements. It is, freeing up your time for experimenting on new predictive requirements, which will never stop coming in. Your business applications can pick up the predictive insights, thereby improving the human or automated decisions made in your organisations. Often the improvements delivered through predictions can be quantified and measured in hard $$$, making it obvious how much value SAP BW is providing. SAP Predictive Analytics is the obvious extension of SAP BW to benefit from predictive insights. 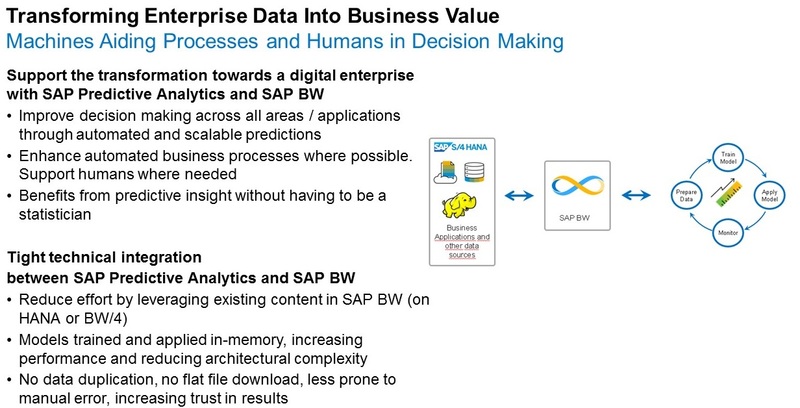 If your BW is running on SAP HANA (or you are even already on SAP BW/4HANA), SAP Predictive Analytics can connect directly to your SAP BW logic, leveraging the past efforts you put into data retrieval and modelling. The predictive models can be trained directly in SAP HANA, thereby avoiding unnecessary data movement and opening up a world of real-time capabilities. Manual steps such as data downloads are avoided, increasing the trust in the predictive results. The next blog in this series is looking at the technical integration. Hello Andreas, excellent blog series! The topic of SAP Predictive Analytics used with BW/4HANA be covered during a dedicated hands-on ANA266 “Unleashing Machine Learning in SAP BW/4HANA Using Predictive Analytics” in SAP TechEd Bangalore & Barcelona. There was a very nice attendance in Vegas already.